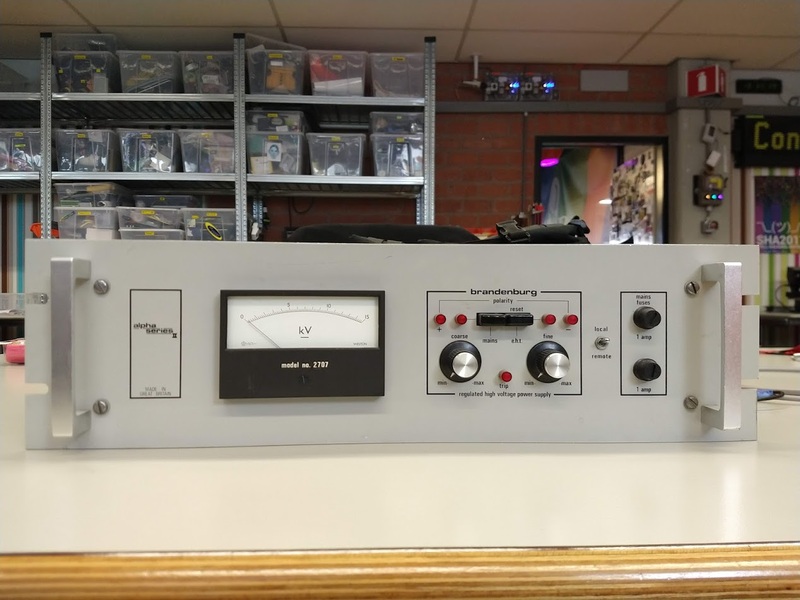 To create a safe and reliable high voltage DC supply for fun, demonstrations and simple experiments. A small inverter, driving a cockcroft walton voltage multiplier. Low voltage DC input is switched to drive a small step-up transformer, generating modestly high voltage AC (at around one kilovolt). This is then fed into a voltage multiplier, resulting in an output of many kilovolts DC. The inverter is driven at a high frequency (tens to hundreds of kilohertz), which means we can get away with relatively low-value capacitors. There are a number of ccfl inverter topologies you might run across when you bust open an old lcd. More 'modern' ccfl backlight designs feature a controller of some sort to enable better power and brightness control, but the simplest kind you will find is nothing more than a (resonant) royer oscillator. I found a couple of these old-style monitors on the RevSpace free stuff table over the past half-year, and salvaged the relevant components from their inverter board, which I then plonked on to a proto-board to make the heart of the high voltage supply. It's certainly not pretty, but seems to work just fine. The only change that I made to the circuit is the option to bypass the 22pF cap on the output, which helps pull more power out of the inverter. The voltage multiplier is a bipolar cockcroft walton, This seems to work the best, and has the added benefit of being visually more interesting that a single half-wave variant. A full-wave CW would be best, but unfortunately ccfl inverters just don't come with a center tap on the secondary. As for the components I used, they are the cheap kind, from ebay/aliexpress. The caps are 10nF 3kV blue ceramics available in packs of fifty for three dollars. The diodes are just a series string of 1n4007 rectifiers. In the configuration I used, the components in the multiplier see about 2Vp (it would be 3Vp for a full-wave multiplier). I am not entirely sure exactly how high the output is on the secondary, especially when it is minimally loaded (as is the case when the multiplier is charged and open-circuit towards), and given their provenance I don't have much faith in the ratings of the capacitors, so I chose to be generous in terms of margins. I put two caps in series for a rating of 6kV, and in the case of the diodes, I started with four in series for a rating of 4kV. I ran out of 1n4007's at some point and cut back to series chains of three; I have not seen any failed diodes. Whether you choose battery power or a lab supply, the option to vary input voltage is useful, as this is a crude but effective way to vary the output voltage. With a current-limiting capacitor on the output of the inverter I would suggest a maximum of 12v input. This seems to be the standard voltage they are run at in the original application as well. Current consumption is relatively stable, clocking in at a few hundred mA. If you omit the output cap, the inverter will charge the multiplier much faster, and the input current after discharge peaks significantly over 500mA. I would suggest limiting input voltage to around six or seven volts in this configuration. I did add extra heatsinking to the transistors by soldering them to a bit of copper tape, but they will quickly overheat if you abuse the inverter in this fashion for any length of time. Running with the cap on the output doesnt seem to cause any significant heating whatsoever. If you choose to use a lab supply, or anything mains referenced, remember that an arc-over could lead to the output becoming mains-referenced as well, and a fault could easily take out the supply and anything connected to it. I recommend running this thing from a battery, or even a regular usb power bank (perhaps with an adjustable boost converter after it to vary the voltage). Take care to insulate the circuit (and the battery) from its surroundings, and maintain the floating outputs if at all possible. This way you can even safely touch just one side of the output without getting any major shock, which helps during demonstrations. As for the multiplier, it is best to elevate it or prop it up on something non-conductive. It turns out that table-tops and other surfaces that you normally consider to be insulators are sufficiently conductive at these potentials to bleed a lot of charge. Avoiding sharp points helps, but given the construction technique I used for my multiplier, this was difficult to do. It turns out that separating the two halves of the multiplier in a V-shape and maintaining adequate distance reduces corona enough, and seems to work just fine. I guess you could use oil or potting, but at these potentials this seems overkill to me, and has the downside of obscuring the components. Perhaps as a final note, I should say that being shocked by this thing is quite unpleasant, so please try to avoid it. Be especially careful not to shock yourself across the chest, and use only one hand when you mess with it. 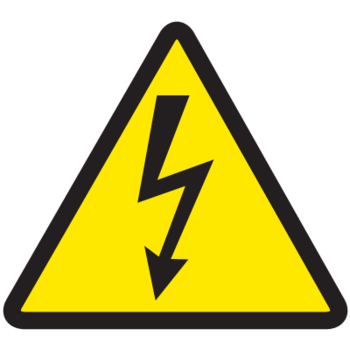 Things do get scary very quickly when you attach any sort of capacitance to the output, and be mindful that at these voltages even small capacitance can represent significant hazard. Just keep your wits about you and use common sense. Take care to discharge the caps of the multiplier when you're finished (just shorting the output is not enough to dissipate the charge across all the caps in the chain, which may still have the potential to give you a nasty tickle) In conclusion, If you follow along, know that you are doing so at your own risk. Proto-pcb with ccfl inverter. Note the color coded legs of the transistors (green for base, yellow for collector, blue for emitter). Schematic of the multiplier, from Wikipedia. Schematic of a resonant royer circuit, also from Wikipedia. Update August 2018: Working on a manually switched capacitor bank to boost output voltage by 5 times and create bigger sparks for the upcoming science weekend. Update February 2019: Temporarily storing an old lab-grade HV supply in the projectkast, 3d printing a custom HV connector for it and making it available for experiments at the space. Please don't use without permission, it bites! This page was last modified on 14 February 2019, at 01:40.